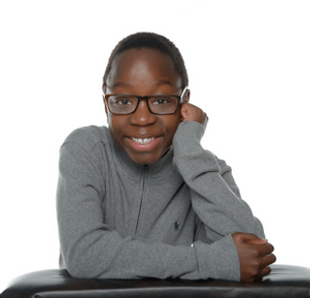 Meet Christopher, a rising 6th grader at St. Martha Parish School. Christopher is passionate about performing arts and spends his free time singing, dancing and acting. He is excited to begin his role as a student council representative next year and looks forward to mentoring younger students. His mother, Antoinette, attributes her son’s high academic performance and overall happiness to the challenging curriculum and supportive services at his school. A: I like to read, sing, dance, act, and write. I love musical theater. I also like to play outside and ride my bike. Sometimes I read a chapter of a book if I can’t fall asleep at night. A: I love English language arts and writing. I love writing stories and using my imagination. I think that when I use my imagination I can accomplish anything I put my mind to. A: My role model is Lin Manuel Miranda who wrote and performed in one of my favorite musicals, Hamilton. It’s about one of America’s founding fathers, Alexander Hamilton. A: I want to major in musical theater and become a writer. I love the performing arts and using my creativity to make projects. A: I look forward to starting a new chapter in my life as a student council representative. I cannot wait to learn new things. I can’t wait to gain new knowledge and to use it for future conflicts. I am also looking forward to singing in my school choir, cantering and helping to mentor my younger schoolmates. A: I hope for Christopher to continue to do his best and achieve his dreams. I want him to have the opportunity to get the best education in order to have a bright future doing what he loves. Q: What makes your child’s school the best fit for him? A: St. Martha Parish School is an amazing school and offers the best education for Christopher. He simply enjoys the loving and helpful teachers who teach him several subjects, emphasizing religion. The school is a family where everyone fits in. Christopher always learns new things and loves being able to socialize with his friends, who he can relate to. It truly is a loving and safe place for a child to thrive. A: I personally feel a tuition-based school is definitely worth it. Th class size is just right allowing the teachers to adequately provide the necessary support that a child might need. The curriculum is more rigorous and the students have access to specialized programs. The overall performance of the student is outstanding in a safe environment. A: My family has been impacted positively since winning the CSFP lottery. I do not have to work long hours and can now spend quality time with my family. We have the opportunity to attend many CSFP sponsored events and spend time together bonding as a family. A: I will tell others who are looking to apply for a scholarship that it is well worth it. Your child’s education is such a powerful achievement and a scholarship will make the difference. I will also tell them to apply early and keep applying yearly until they win. Students and faculty at St. Martha's hosted an appreciation breakfast for police and firefighters on Tuesday, January 31st, to help celebrate Catholic Schools Week. Attendees were entertained with patriotic songs performed by the children. 2015 was a great year for Father Al. First, he was recognized by the Office of Catholic Education with a Certificate of Appreciation for his service as pastor, and now he's in the news with an article and video in Philadelphia Neighborhoods - Far Northeast Edition. Click here to read the full article and watch the video. See and hear for yourself about what makes St. Martha Parish School so special! Miss the great family feel of St. Martha's grade school! Teachers with hearts of gold, parents who go above and beyond, the definition of community! Will never forget my children being part of a rare experience!